This post is sponsored by iHerb, all opinions are 100% my own. Boy, do I have an amazing recipe for you today! I’m going to show you how to whip up a combination of a croissant and muffin that is often referred to as a cruffin. 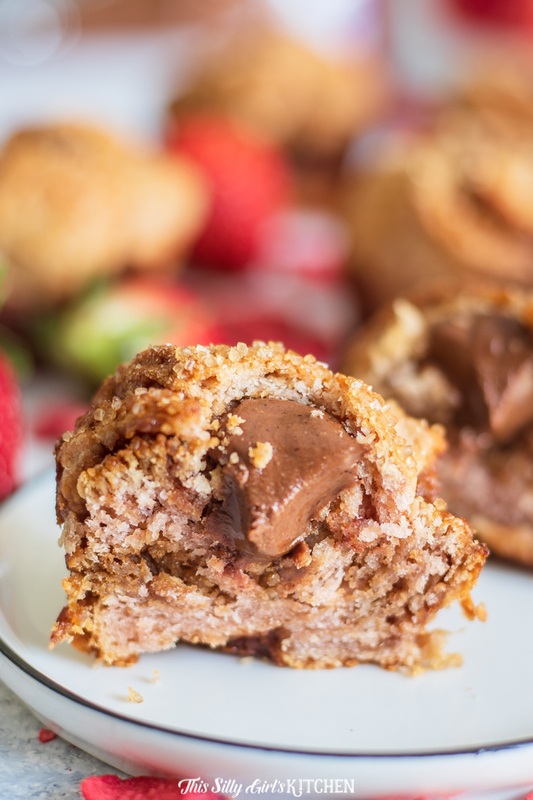 This chocolate strawberry cruffin recipe will have you begging for more! iHerb is an online grocery store specializing in natural products for a great value – love that! I used Natierra Organic Freeze-Dried Strawberries from iHerb in the dough for our cruffins to make the flavors really pop! Plus, it gave them their pretty natural pink color on the inside! 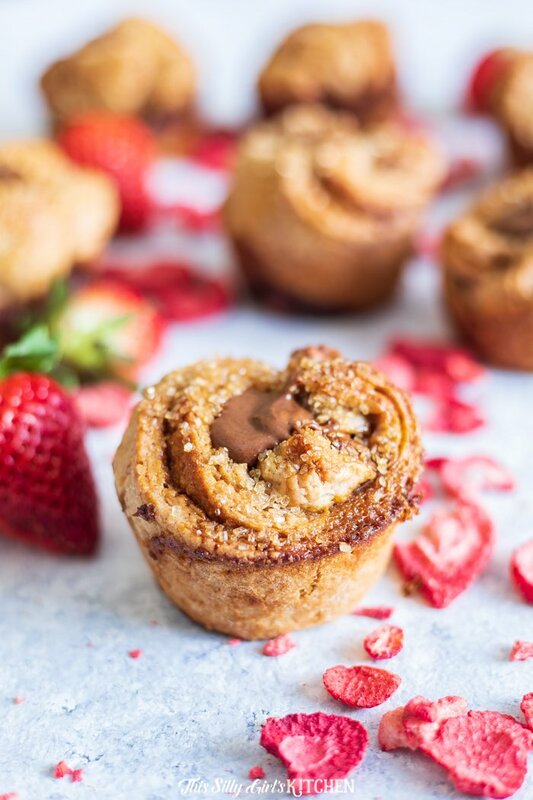 Strawberry cruffins stuffed with Justin’s Nut Butter, Chocolate Hazelnut Butter Blend?! Oh my!! A decadent treat made with better-for-you ingredients so you don’t feel so guilty enjoying a little sweet. What’s not to love?! Thanks to iHerb it is so much easier now to get the best overall value in natural products to customers all over the world. Almost all the ingredients for our cruffin recipe today is from iHerb- score! What makes this chocolate strawberry cruffins recipe extra decadent is the fact that I’m using the dough from my Lemon Berry Sweet Rolls. It is a Danish pastry dough that comes out perfectly flakey every time! 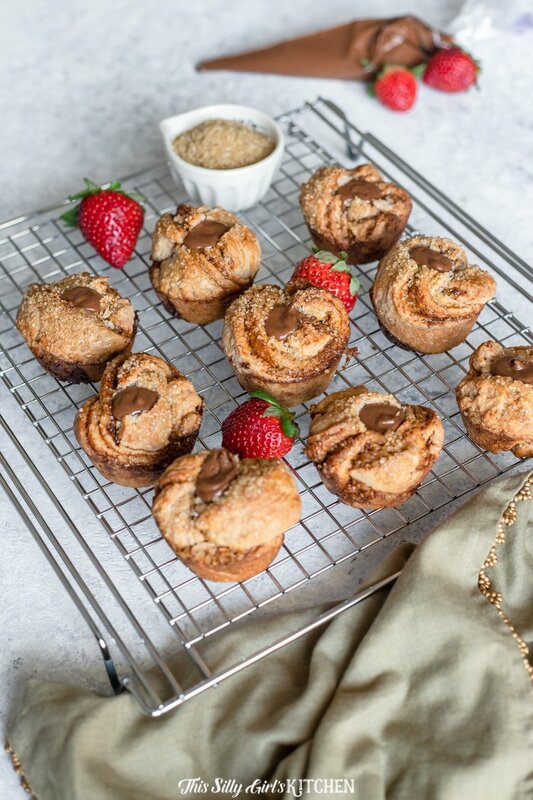 The only difference between the dough in that recipe and this chocolate strawberry cruffins recipe is that I’ll be adding pulverized freeze-dried strawberries to make the dough taste like strawberries. How fun is that? 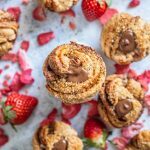 This recipe can be served as a breakfast treat or special dessert, these chocolate strawberry cruffins will surely make anyone smile big time. I’m using ingredient options from iHerb to make this recipe a little healthier for those who want a guilt-free sweet treat. Plus, with their triple guarantee, you will leave 100% satisfied with your purchases. Value – iHerb guarantees that you will receive the best overall value in the world for over 30,000 brand name natural products. Quality – As a California based superstore, iHerb guarantees that all products are authentic brands sold in the U.S. market. iHerb is committed to providing quality assurance for our products and ship directly from climate controlled warehouses. Delivery – No excuses. We guarantee delivery of your order! – We provide free or discounted shipping to over 150 countries around the world. 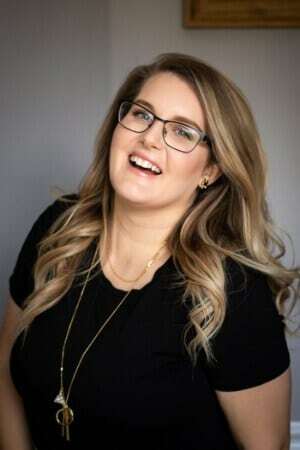 I genuinely loved all the products mentioned in this post. Especially knowing they are all natural without having to second guess while shopping is a huge stress reliever. A cruffin is a hybrid recipe that mixes a croissant with a muffin. This pastry is made by baking your cruffin dough in a muffin pan. Once baked the cruffin is usually filled with some form of cream, my cruffin recipe is injected with Justin’s Nut Butter, Chocolate Hazelnut Butter Blend but you can inject your cruffins with any jam or other cream filling that you desire. Why do you use Freeze-Dried Strawberries in your cruffins recipe? I personally prefer to use freeze-dried strawberries in my cruffins recipe because it eliminates the extra liquid from fresh strawberries that may make your cruffins soggy. 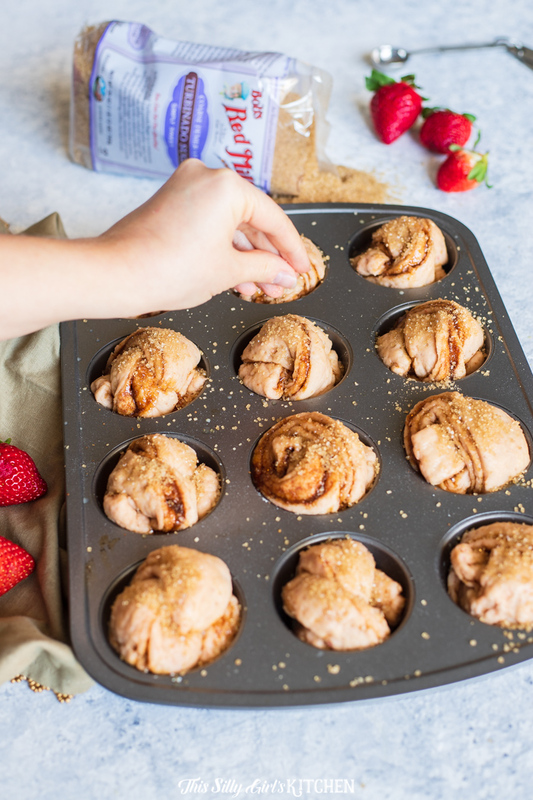 Not only does Natierra Organic Freeze-Dried Strawberries work well to ensure you don’t have too much liquid, but they’re also a healthier-for-you option when you want to indulge in this sweet chocolate strawberry cruffins recipe. Just like our sweet rolls, we start these cruffins off with the dough. 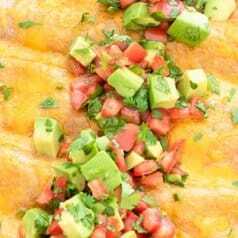 Warning – this is a labor of love and can take up to two days to make! 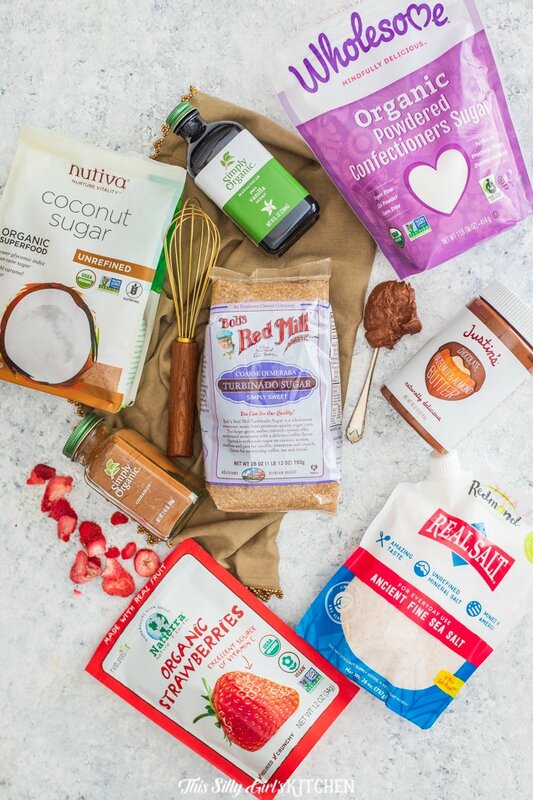 The dough comes together in no time with milk, yeast, egg, Simply Organic Pure Vanilla Extract, coconut sugar, all-purpose flour, freeze-dried strawberries (which we turn into powder! ), and a pinch of Real Salt, Ancient Fine Sea Salt. Next comes the rolling out of the dough and folding, this is what makes all those flakey layers! A thick layer of unsalted butter makes all those layers puff up while baking – ummmm, YUM! Once the folding process is complete, we have to do this 5 times! Believe me, it’s worth it. The dough must sit in the fridge covered for at least 5 hours, but even better overnight. 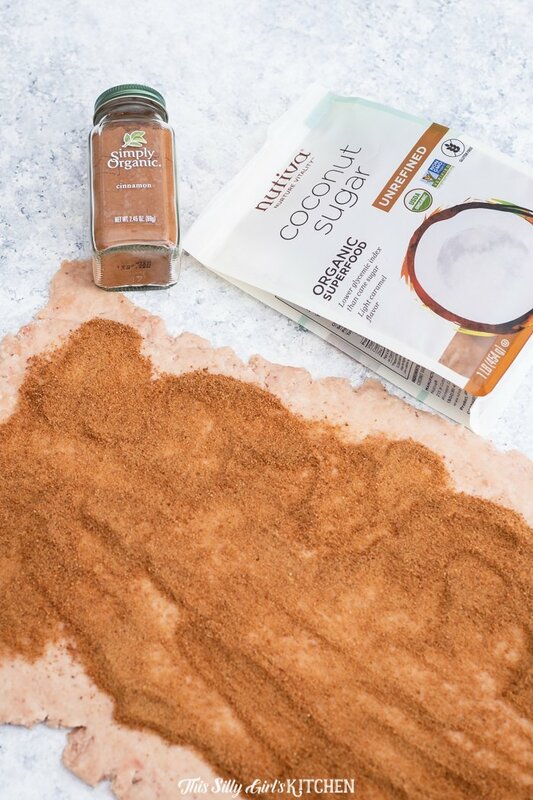 The next step is to roll out the dough again, except this time we sprinkle Nutiva Organic Coconut Sugar and a touch of Simply Organic Cinnamon over the rolled out dough. Fold this over itself so all that cinnamon sugar is tucked on the inside. Roll the dough out again, and cut into 12 even long strips. 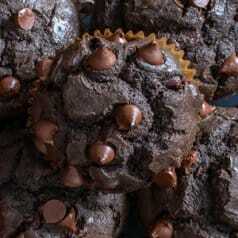 Knot the strips and place into muffin tins. Let the cruffins rise in the tin until they double in size, brush on an egg wash, and sprinkle the tops with Bob’s Red Mill Turbinado Sugar, for a sweet, crunchy top! Let cruffins cool on a wired rack in the muffin tin for 5 minutes, take them out and place them directly on the rack to cool completely. 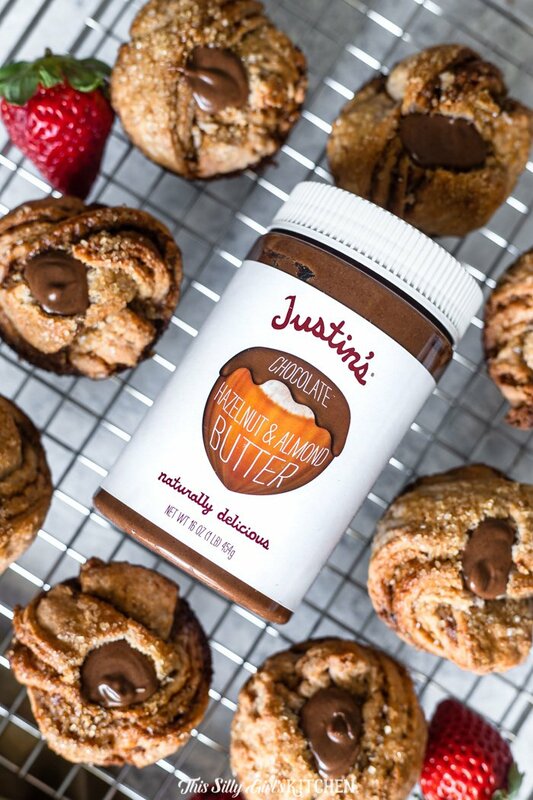 Taking a piping bag, inject each cruffin with that amazing Justin’s Chocolate Hazelnut Nut Butter! An alternate take on these would be to not inject the cruffins but to add a sinful glaze on top. Add 3 cups Wholesome Sweeteners, Inc., Organic Powdered Confectioners Sugar into a medium-sized bowl. Add 1/4 cup milk and 1/2 teaspoon vanilla extract, whisk to combine. If you like a thinner glaze, use more milk, for a thicker glaze, use less milk! Is a croissant bread or pastry? Croissants are made of layered yeast-leavened dough. This dough is often layered with butter and rolled several times. This process is called laminating and is what one does when making a cruffins recipe using croissants. The laminating process results in a flaky and layered textured which makes a croissant a pastry, not bread. Does freeze dried fruits lose nutrients? When you compare dehydrated fruits with freeze-dried fruits, the consensus is that freeze-dried fruits hold more of their nutrients than dehydration does. This is why I opted to use Natierra Organic Freeze-Dried Strawberries in my cruffins recipe. This helps make my chocolate strawberry cruffins a better-for-you option than other strawberry liquid options. Want to try some products from iHerb? Just click here to be taken to the iHerb website! New customers will receive a 10% discount and returning customers will receive a 5% discount, woohoo! 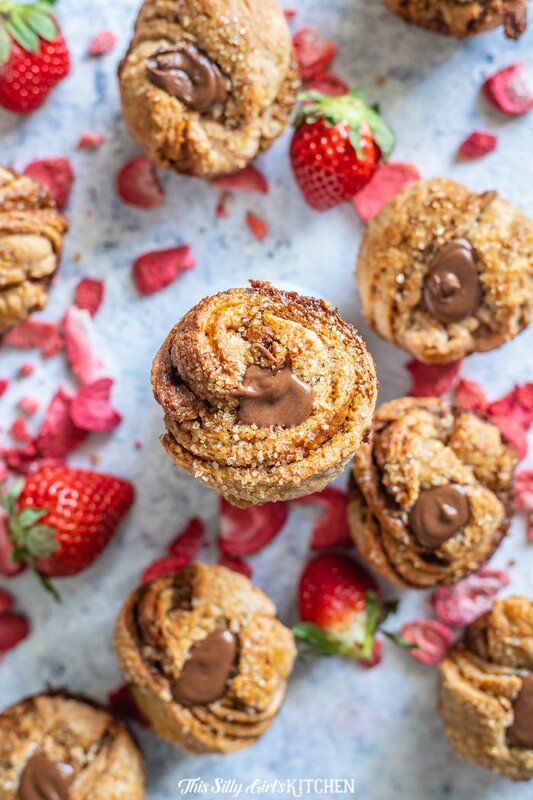 Now that you’ve read all of my ramblings, I bet you’re ready to find out what ingredients you need to get started making your own chocolate strawberry cruffins today. A pastry hybrid, croissant muffin! 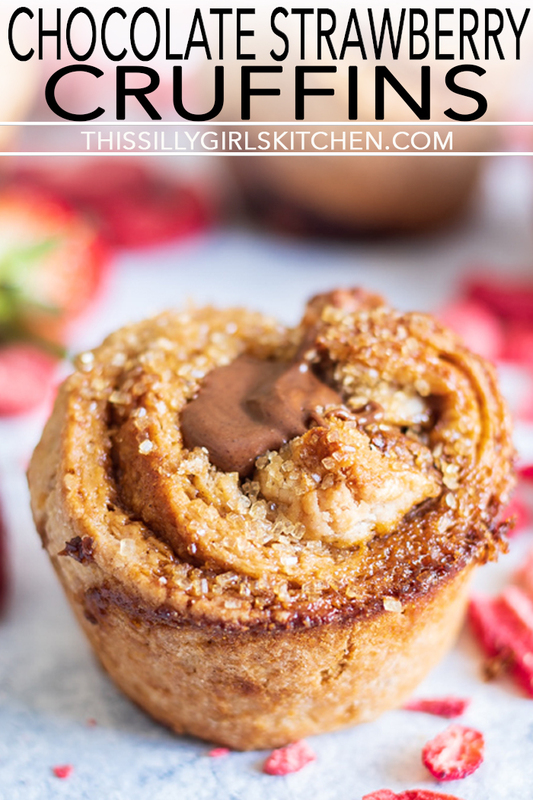 The dough is strawberry flavored and stuffed with chocolate hazelnut butter. 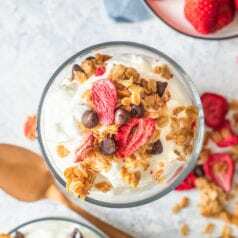 Place the milk in a medium-sized bowl and microwave in 15-second intervals until it reaches 110°F, you will know it is at the correct temperature when a meat thermometer placed into the milk reaches 110°F, do not heat for longer. Sprinkle the yeast on top, and let sit 5 minutes. Add the beaten egg and vanilla, mix to combine. In a large bowl, add the flour, sugar, freeze-dried strawberries, and salt. Whisk to combine. Melt 1 & 1/2 tablespoons of the unsalted butter and mix into the wet ingredients. Pour the wet ingredients into the dry ingredients and stir with a wooden spoon until a loose dough starts to form. On a clean, lightly floured work surface, turn out the dough and knead by hand until the dough comes together with no dry spots, but do not overwork. The dough will still be slightly wet/tacky. Form the dough into a rough rectangle and place it onto a baking sheet that is lightly floured, and lightly flour the top of the dough. Cover with plastic wrap and place in the fridge for one hour. Lightly flour a clean work surface. Roll out the dough into a 10x17 inch rectangle. Make sure it is not sticking to the work surface, add more flour if necessary. With a short side of the dough facing you spread the softened butter (it should be very soft but not melty, just easy to spread) over the dough on the lower two-thirds. Leave a 1/2 inch border around all the sides and do not butter that area. Now, make a three-way fold. Fold the upper 1/3 of the dough over onto the buttered side, towards the center of the dough. Next, fold the lower 1/3 of the dough on top, making a rectangle. No butter should be exposed, it is sealed completely. Pinch all the edges on the seams so no butter escapes. Gently roll out the dough into a 10x17 rectangle. Keeping the surfaces lightly floured. Brush off any excess flour, and again, take the top 1/3 of the dough and fold in toward the center, take the bottom 1/3 of the dough and fold on top to form a rectangle. Place back on the baking sheet and cover with plastic wrap and refrigerate for 45 minutes. Repeat this same folding and rolling out process three more times with 30 minutes in the fridge between each interval. After the last fold, place it back on the sheet tray, cover with plastic wrap and place in the fridge for 5 hours, preferably overnight. When you are ready to prepare the rolls, roll out the dough onto a lightly floured, clean work surface into a 20x12 inch rectangle. Have the longer side facing you. Next, add the fillings. Mix together the cinnamon and sugar. Sprinkle all over the dough, leaving a 2-inch border around the whole dough. Press the sugar into the dough, and do the same 1/3 fold as previous. Roll out again into a 20x12 inch rectangle. Cut into 12 even strips, this is most easily done with a pizza cutter. Tie each strip into a loose knot and place into a muffin tin. Cover with plastic wrap or a clean kitchen towel and place in a warm place until the dough is about doubled in size. Depending on the temperature of your home, this can take about an hour and a half. Preheat the oven to 350°F. Beat together the egg and water to make an egg wash. Brush the egg wash lightly on top of each cruffin. Sprinkle on the turbinado sugar onto each one. Bake for 18-20 minutes until golden brown. Let cool for 5 minutes in the muffin tin on a wired rack. Once slightly cooled, take out the cruffins and let cool completely on the wired rack. Once the cruffins are cooled, warm up the chocolate hazelnut butter in a microwave-safe bowl by microwaving in 15-second intervals, stirring in between until pipeable. Place the chocolate hazelnut butter into a piping bag or a resealable plastic bag and cut a small corner off. Taking a pairing knife, cut a small hole into the top of each cruffin and stuff with 1 tablespoon the chocolate hazelnut butter each. **You can do this in a blender.